We take a break from all the video game talk this week to talk about Nerf. Nerf comes up from time to time on That F’ing Monkey because we love Nerf guns. I used to keep a blaster in my desk drawer at work just in case a Nerf fight broke out. I had a huge Nerf arsenal when I was a kid. The Nerf releases that we’re looking at today aren’t meant for me. 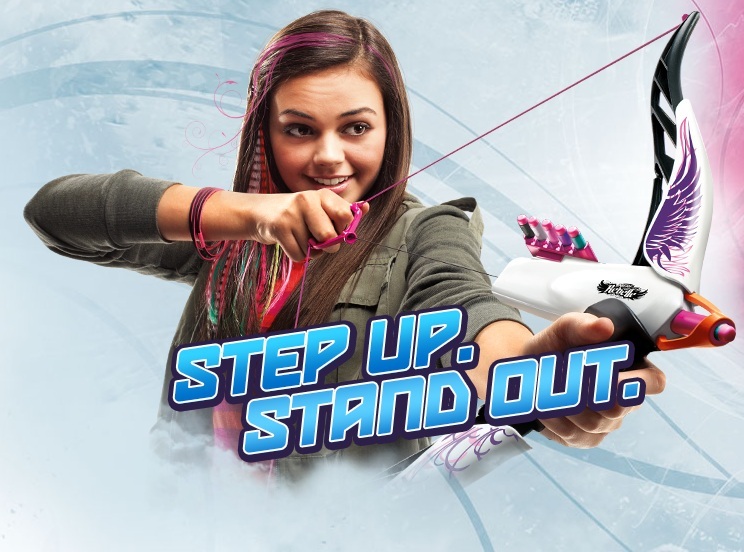 You see this fall Nerf will be releasing the Rebelle line of blasters, a line advertised directly at a female audience. 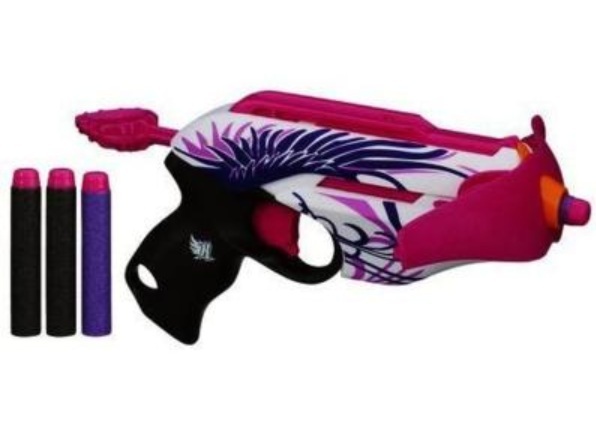 With their neon colors I never really thought of Nerf as a gender specific toy, but it makes sense that Hasbro wants to capture the female market. The Rebelle line is made up of mostly new blasters, so they aren’t just repainting last year’s line pink and calling it a day. It seems like the two items they are pushing the hardest will be a bow and a crossbow, so it looks like they are trying to cash in on the Hunger Games fueled interest in archery. The bow is called the Heartbreaker Bow. 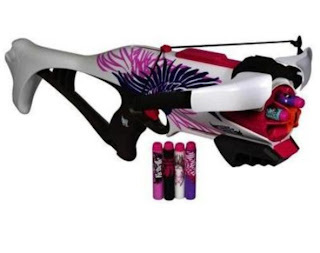 Nerf has a long history with bows and I still remember the one I had as a kid. At that time the bow fired large foam arrows, this new version fires “collectible darts”. The collectable darts appear to be Elite darts repainted. The darts have different color schemes and/or graphics and all have pink tips. The Heartbreak Bow will be available in Phoenix (purple) and Vine (blue) versions. The Guardian Crossbow is a bit of a letdown for me. The original Nerf crossbow was one of the best blasters ever made. It could fire the larger arrow darts and mini-darts. I the Guardian was a version of this crossbow I would have bought one, regardless of the color. Instead the Guardian can hold up to six collectible darts and can be single fired or slam fired. Slam firing is when you hold the trigger down and repeatedly prime the blaster. Each time you prime a dart automatically fires. 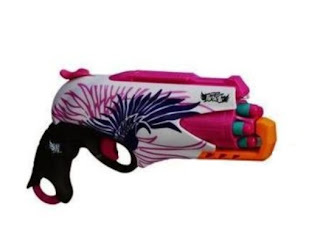 The Pink Crush is a strange gun. The large pink piece at the end of the barrel mimics the arms of a crossbow but can be removed if they are getting in the way. The rest of the body looks like a Nerf Firestrike with the flashlight removed. It’s a single fire blaster with a ten dollar price point, so it’s meant to be one of the cheaper entries into the line. This is just your standard Nerf blaster, so it's a little boring compared to the other offerings. The Sweet Revenge is the most interesting of the Rebelle lineup. The Sweet Revenge is the exact same gun as the Zombie Strike Hammershot, it’s just repainted to fit the rest of the Rebelle line. The gun holds five darts and actually use hammer-action to prime the dart. You can hold the gun in one hand, use your thumb to pull back the hammer, and then fire. This is huge because on all the other non-motorized Nerf guns you would need a free hand to pull back the primer. There is no word on whether or not you can fan the hammer like on a real single action revolver. The Sweet Revenge is going to be sold in a kit that comes with a holster and sunglasses. The smallest of the guns is the Sneak Attacker. 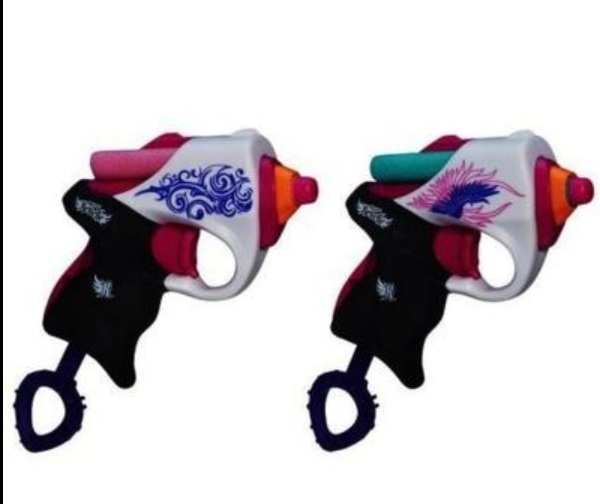 It will actually be sold in the Power Pair blaster set. So for thirteen dollars you get a tiny blaster for you and a friend. That’s Nerf’s initial lineup for the Rebelle line. I hope it does well for them because Nerf should be enjoyed by everyone. What do you think ladies? Does this make you want a new Nerf gun? I agree with that the previous Nerf guns were gender neutral and these pink ones seem unnecessary but I understand the marketing ploy. The names of these toys seem to imply that the girls will be hunting for boys. Ugh. I'd buy a Nerf gun, but no pink for me. Be that as it may, becoming acquainted with the item more would give you a reasonable seeing how it is not quite the same as different toys in the market and why it is appropriate for your children and even the children on a basic level.